The presentation will be followed by our regular support groups for stroke survivors and caregivers. 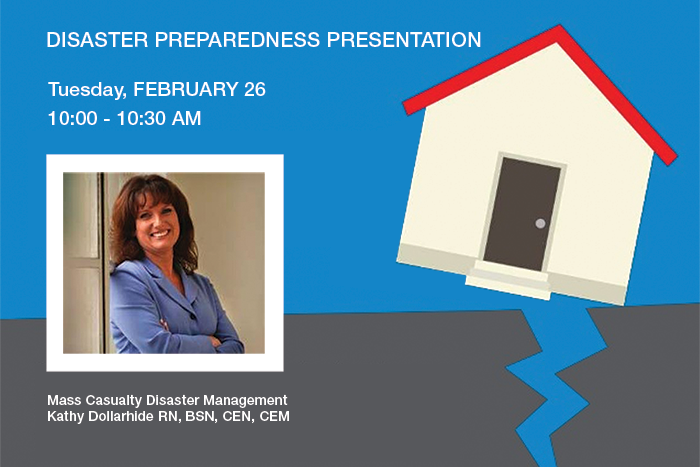 This presentation will give information on Disaster management in the City of Long Beach. How can we best prepare for floods/earthquakes and what access and functional needs programs are occurring in our city. How to make an earthquake kit for your family will be the focus. Discuss what should be in an earthquake kit. Describe what hospitals and the City of Long Beach are doing on a regular basis to make Long Beach a more prepared neighborhood (drills, training, and education). Kathy Dollarhide is the Director of the Disaster Resource Center at Dignity Health St. Mary Medical Center in Long Beach. She teaches under a grant from Homeland Security/ASPER on topics such as CBRNE, Hazmat/Decontamination courses, trauma classes and coordinates multi-agency disaster drills. Prior to St. Mary Medical Center she was the Emergency Preparedness Consultant at the Harbor-UCLA Medical Center Disaster Resource Center, the American Heart Association Community Training Coordinator and an ER nurse for 25 years. Kathy is a training officer for the Defense Medical Readiness Training Institute (DMRTI) for the Department of Defense at Fort Sam Houston. She has been faculty Combat Care Casualty Training programs for the US Army and an instructor of HERT for MCI courses at Noble Training Center in Anniston, Alabama. She has been an instructor at Cal State University Long Beach EMT program and guest speaker at the undergraduate and graduate levels in Hospital Administration and Nursing at CSULB.